The FDM-DUO when coupled to the FDM-SW2 software can be made to receive up to 165MHz by changing a few menu settings directly on the FDM-DUO and editing a file used by the FDM-SW2 software. The menu instructions are in the user manual, but the file hack to allow the FDM-SW2 is not. The software hack allows the FDM-SW2 software to tune up to 165MHz rather than stopping a 54MHz. Elad calls this the “Experimental Mode” because it’s not really intended to be a feature at this time. The FDM-DUOs’ firmware won’t let the radio tune this high through the front panel, so you have to use the FDM-SW2 software to do this. Since most of the appropriate filtering is missing here, you will get lots of FM broadcast images mixed in in some areas of the frequency range up to 165MHz. To use this range more seriously you will need to add an external filter or a preselector. However, if you want to to play around with it, just attach a small whip to the RX antenna jack. You can then tune in your local FM broadcasts. By setting the FDM-SW2 Software to WBFM, you will get some gorgeous FM Stereo audio if you listen through some good headphones or external speakers. You can also use this feature to monitor your local FM repeater (if no FM broadcast images are on the frequency). By the way the FDM-DUO will also transmit on 2 meters through the 0dBm SMA jack at .01W. – to unlock SW-2 open FDMSW2SwSetup.xml (found in your Documents folder in the Elad folder) and with an editor search for UnlockDUOt at the bottom of the file. Set it to 1. The FDM-DUO is already a very good direct sampling transceiver all by its self. When coupled to the FDM-SW2 software it turns the FDM-DUO into a little SDR powerhouse by offering more features and performance options. You will have more control over settings like filters, audio quality, 3rd party interfacing, audio routing and other tweaks. Having the waterfall and spectrum display available adds a great deal more utility to using the FDM-DUO. In a nutshell, the overall experience of using the FDM-DUO as a SDR system is outstanding. Elad is continually improving and adding new features to the FDM-SW2 software to make the experience better. Elad got so many things right with the FDM-DUO that it is hard find much to criticize. Unlike so many SDR systems available today, the FDM-DUO SDR system feels like less of a “science project” and more of a finished consumer product. For those who wants a SDR radio system that “just works” and easy to use, the FDM-DUO is a great choice. 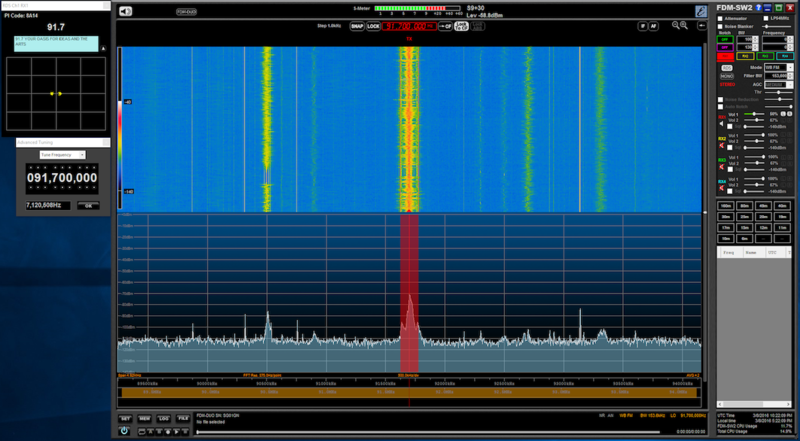 Also, kudos to Elad for providing such a well done SDR program. The program was very stable over the review period. No, crashing at just the wrong time say during a contest. Heck even if it did, it wouldn’t matter much since you could just continue on using the FDM-DUO as a standalone rig. With some of the larger radio manufacturers dipping their toes in the SDR area, they should take note of what Elad has done with the FDM-DUO. Elad has truly created a very flexible multi-use system with the FDM-DUO and a darn fine SDR radio system at a very good value.